13 Craven Terrace London W2 3QD. RCA HOTELS is happy to introduce to you our ‘fresh and funky’ Boutique Bed & Breakfast hotel, the Oxford Hotel. 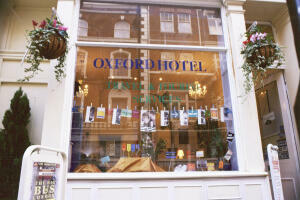 Oxford hotel is set in a beautiful building on a quiet side street that leads directly to the gates at Hyde Park. * LOCATION: Ideally located in the quiet surroundings of Bayswater, close to Kensington Gardens and Knightsbridge. * A leisurely stroll brings you to Piccadilly Circus, Soho and Covent Garden, Trafalgar Square, Houses of Parliament, Big Ben, Westminster Abbey, Buckingham Palace, West End Theatres, and…. the London Nightlife. All this and more just moments away. ROOMS: There is a selection of 21 rooms with en-suite facilities. Rooms available vary from single, double or twin, triple, quad/family rooms – sleeps 4. All rooms include: en-suite shower & w/c, telephone, satellite TV, tea/coffee –making facilities, microwave and Hair dryer. * There is no lift, but ground floor rooms are available on request.